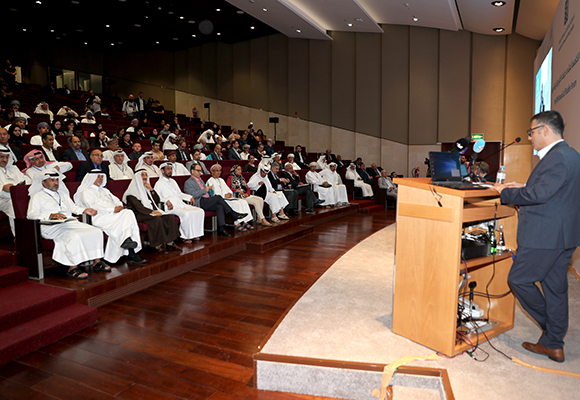 The fifth annual Gulf Studies Forum opened on Saturday, December 1 in Doha at the Arab Center for Research and Policy Studies. On this occasion, and for the first time, two tracks of panels ran simultaneously: one track focusing on the topic of US-Gulf Relations, and another on Social Transformations in the Gulf. 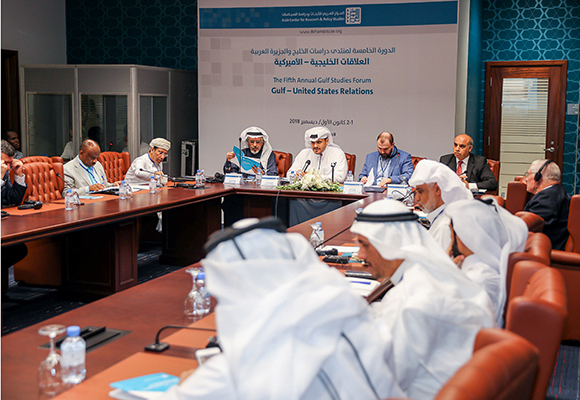 During the opening remarks, the ACRPS’s Dr. Marwan Kabalan, Chair of the Gulf Studies Committee, noted that the Forum has become an important academic platform for research on the Gulf region and its relations with its neighbors, the region, and the world more broadly, and that over the course of the last four years it has been established as one of the Center’s outstanding research programs. He also pointed to the continuous growth in the number of submissions as evidence of the great interest in participation. 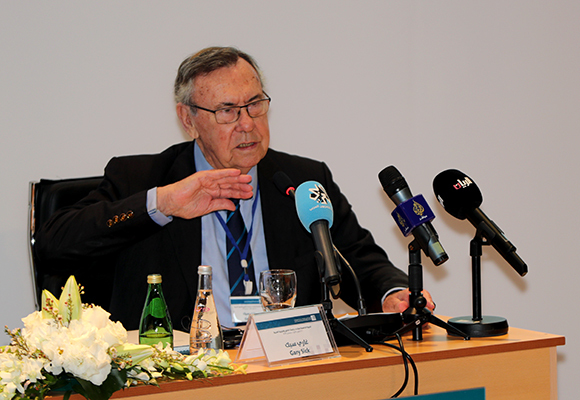 The keynote address was delivered by Gary Sick, Senior Research Scholar at the School of International and Public Affairs at Columbia University. Sick discussed transformation in US policy towards the Gulf states, with a focus on its checkered past of distaste, suspicion, and upheaval. Sick described the acceleration of US penetration of the region after the Iraqi invasion of Kuwait and US’s formation of an unprecedented coalition that succeeded in defeating Iraq. This allowed the US, making use of the considerable supporting infrastructure put in place during the Kuwait campaign, to invade Afghanistan and Iraq and later to conduct its war against terrorist groups throughout the region. Sick then discussed the current global crisis facing US foreign relations, highlighting the fact that in spite of its substantial military presence in the Gulf, there are signs that the US has begun to grow tired of this role and that it is seeking a gradual return to its former more modest presence in the region. The first session of the Social Transformations track dealt with the problem of identity. 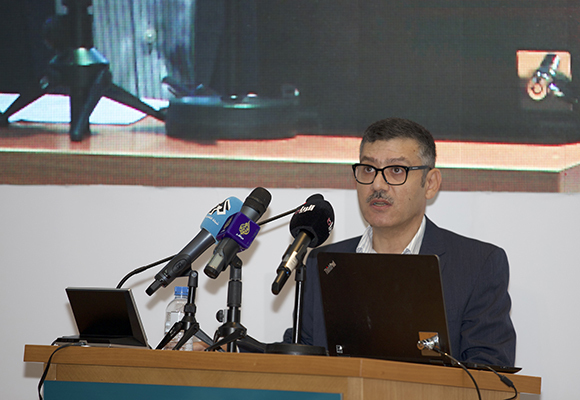 Mohamed Ghanem Alrumaihi, the first speaker, presented on the social and economic transformations that the Gulf was exposed to before and after the discovery of oil. Alrumaihi suggested that Gulf society initially formed with a structure imposed by the desert and by the neighboring sea. 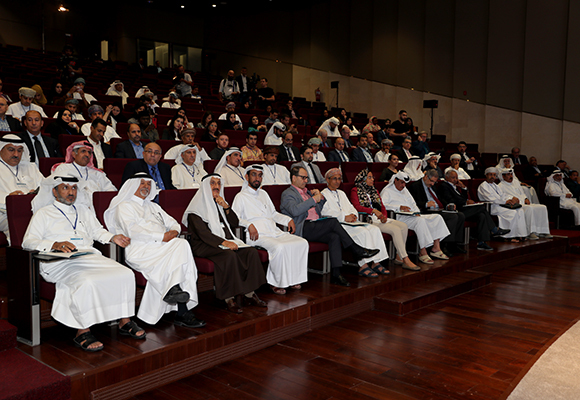 In the same context, the researcher Kaltham al-Ghanem focused on the ability of the Arab Gulf populations to achieve harmony between their religious and historical heritage in the face of the fundamental challenges confronting these populations. She focused in particular on challenges striking at the heart of Gulf identity, which have meant contradictory demands being placed on belonging and behavior. Courtney Freer then concluded the talks, examining the evolution of the notion of tribe under state authority, both British and independent in the smaller Gulf states of Kuwait, Qatar, and the United Arab Emirates. 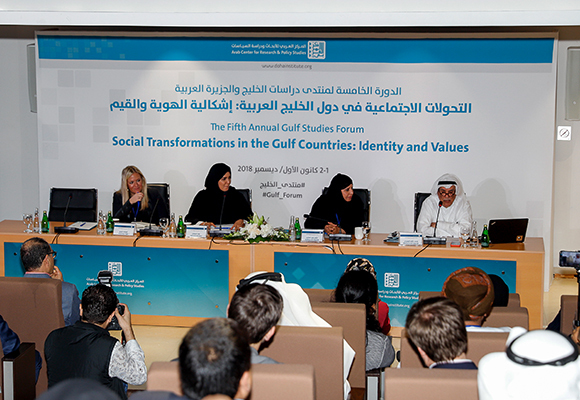 The second session of the Social Transformations track examined the challenges faced by identity in Kuwait, Qatar, and Oman. First to speak was Yacoub Al Kandari, who discussed the danger that the emergence of factional sub-identities poses to social stability and stressed the urgency of reinforcing national identity within society through educational, media and cultural programs. Al Kandari was followed by Mariam Al-Hammadi, whose talk explored how national identity is displayed in the new Qatar National Museum which opened in April 2019. Al-Hammadi discussed the ongoing controversy among specialists and curators who find themselves torn between a desire to display a unified identity for Qatar and wanting to exhibit the cultural diversity of identity within Qatari society, concluding that denial of the historical factors making up current Qatari identity is not necessary to demonstrate the unity and cohesion of society. The last presentation was made by Mobarak bin Khamis Al-Hamdani, who presented an analysis of the phenomenon of the tribe in Oman. Al-Hamdani’s paper presented a series of questions exploring the idea of "social solidarity" achieved by the tribe for its members, the "power" it grants them, or the "social protection" systems it provides – as well as how it impedes the presence of the state. The third session in the Social Transformations track was opened by Mehran Kamrava, whose paper assessed the impact of three of the fastest growing cities in the Gulf – Doha, Abu Dhabi, and Dubai – at the national, regional, and global levels. After comparison of these three cities, Kamrava concluded that while the new port cities of the Gulf are comparatively successful national urban spaces, their success at the regional and global levels is far from certain. This was followed by Ali A. Alraouf’s study, which explores and analyzes the major transformations occurring in contemporary Gulf cities over the last decade. The study suggests that while Gulf cities have tried to shift from a resource economy (oil and gas) to a knowledge economy as the inevitable prelude to a new era, they are still suffering from social loyalties formed in the pre-oil era that have only increased with unprecedented incomes and economic prosperity. The third talk was presented by Dania Thafer, whose paper discussed the differences in both the private sectors’ development pathways and political trajectories shaped by the merchant families of Qatar, Kuwait, and Bahrain and the effect of these differences on identity in the Gulf. The final talk was given by Kassim Ali Shaaban, who presented the linguistic transformations taking place in the Gulf region, especially in Qatar. Shaaban explained that this complex sociolinguistic situation has developed gradually since the discovery of oil and gas in the region and the ambitious human and material development plans that have transformed simple tribal societies into sophisticated urban communities. 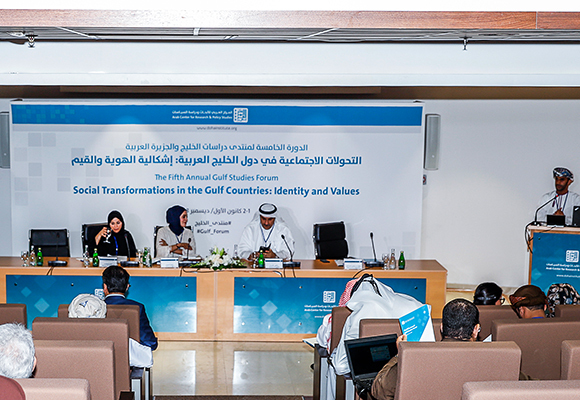 The transformation has created issues related to the individual and collective identities rooted in Islam, Arab ethnicity, and Gulf regionalism. 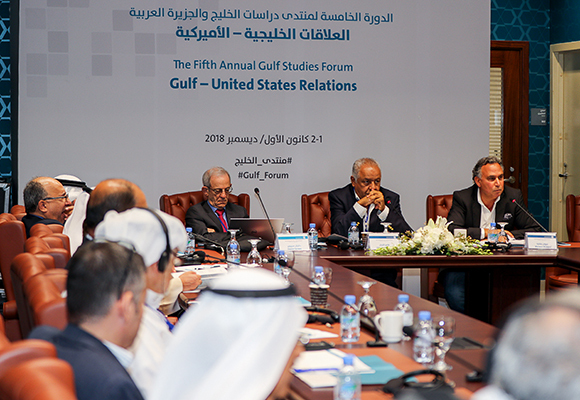 The first session of the US-Gulf Relations track was opened by Daniel Serwer, who discussed the importance of energy supplies to the relationship between the two sides. Serwer argued that the Gulf should no longer assume that the US, which is becoming a competitor in both the oil and natural gas markets, will be prepared to carry the full burden of protecting Gulf supplies, especially as they are now being shipped primarily to Asia. Instead, Gulf oil suppliers should be carrying more of the burden themselves and seeking to engage their Asian customers in the enterprise. The second paper was presented by Marwan Bishara, who argued that Gulf-US relations have endured and indeed strengthened over the past four decades despite various ups and downs since the end of the Cold War. He concluded that Gulf-US relations appear more clearly today than ever before, since certain Gulf powers have increased their political and financial investment to put pressure on US decision-makers, and are coordinating their efforts with Israeli pressure groups to exercise the greatest possible influence. The third presentation was made by Ross Harrison, who analyzed power distribution in the region, arguing that a traditional, realist-based, balance of power concept is outdated given the realities of the Middle East today. He concluded that any balancing that takes place is likely to be by Iran, which has options of strengthening its relationships with regional militias and Russia, an undesirable state-of-affairs for the GCC countries, the region, and the United States. 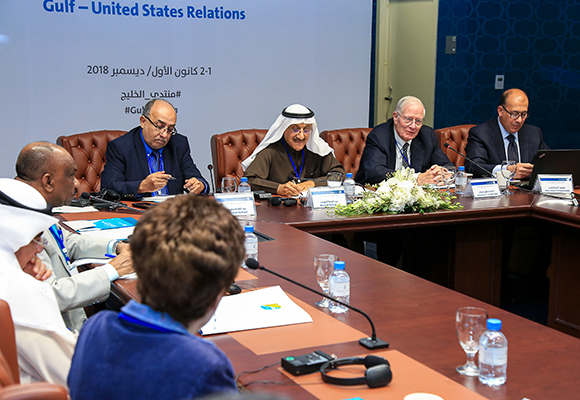 The second session of the Gulf-US Relations track was opened by Anthony Cordesman, whose paper assessed new patterns in the relationship between the two sides. He emphasized that he key common self-interests that drives US and Arab Gulf relations are security – the need to deal with Iran, fight extremism, and secure the flow of petroleum exports out of the Gulf and Arabian Peninsula to meet the needs of the global economy and to provide the key source of income for the Gulf states. He concluded that the US and its Gulf strategic partners do face serious challenges in areas where they currently lack both common goals and coordinated action. The second paper, presented by Abdullah AlShayji, discussed the security dilemma that has been faced by the Gulf states, particularly in the presence of major regional players that constitute a direct threat to Gulf security. The study concluded that the policies and role of the US in the Gulf has deepened this security dilemma and the strategic vacuum filled by Iran at the expense of the safety and security of its Gulf allies. The third paper, presented by Mohamed Elmenshawy, discussed the personalization of Saudi-American relations represented by the relationship between President Donald Trump and Mohammed bin Salman. Elmenshawy concluded that personalization of Saudi-American relations and uncertainty has added a new ingredient, and that today’s relations are subject to a test that neither the reckless policies of Bin Salman nor Trump’s statements may pass. The third session of this track was opened by Dhafer Al Ajmi, who examined Gulf security ties with the USA from the beginning of the 20th century onwards with a focus on the crisis of confidence caused by Obama’s strategic pivot. The study also examined Gulf confidence in the United States since Donald Trump became president and the US administration’s construction of a future political vision that leans towards the traditional strategy with the Arab Gulf states. Al Ajmi was followed by Rory Miller, whose submission examined the implications of this unprecedented regional reality for US-Gulf strategic and security relations in the context of the diverging views of Washington and its local partners over approaches to regional security governance. 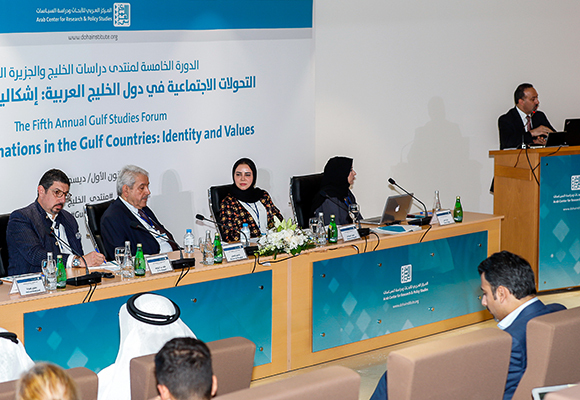 In particular, the study looked at the role of the GCC as an actor in peace and security. 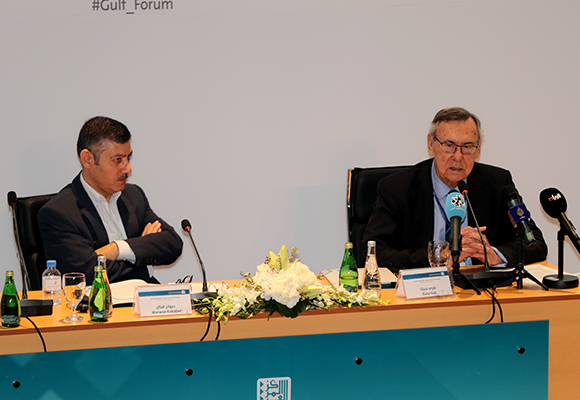 The session concluded with a presentation by Mahjoob Zweiri, who examined the role of Iran in Gulf-US relations, attempting to explore the nature of Iran’s behavior towards the Gulf States in order to better understand the Iranian factor in the relationship between the Gulf States and the United States. The paper then presented examples of the Iranian narrative, which underwent a significant transformation during the period before and after the nuclear agreement, and assesses the impact of US President Donald Trump’s policy, his freezing of the nuclear deal with Iran, and the economic sanctions imposed by the US administration to pressure Iran.